"Board District 3 will look at that proposal for resolution and we will iron it out...We will give serious consideration to everything you said because it is all true"
Carl Petersen on the .Board Meeting Accessibility to the Public. 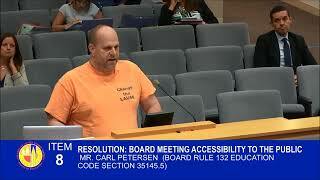 Resolution The LAUSD Board discussed the .Board Meeting Accessibility to the Public. resolution at their March Committee of the Whole meeting. In this deeply divided District, there seems to be one thing that parents seem to agree on. Access to Board meetings isn't working. This has been a long-standing problem. Going back, I found an article in the L.A. School Report in which the former School Board President Steve Zimmer said: "we're going to fix this." A couple of months ago, Mr. Melvoin, you promised the same thing. But it never seems to get brought up. Since I've been attending these meeting for about five years, I looked at the problems I saw and I wrote a resolution that I hope one of you will take up and present to the Board for a vote. This resolution rectifies the problems with five steps. One of them is the time of the meetings. I looked up other local school districts and I could not find one that conducts their meeting during the school day. All of them conducted meetings either in the late afternoon or the early evening. This resolution would change it so that meetings are not occurring during school hours when neither students, teachers or working parents can participate. I also looked at the length of the meetings. Having marathon meetings that go on for hours and hours doesn't work for people who want to present on a specific item. To sit here for hours and hours is unfair to ask of the public. I also looked at the budget meetings which have a history of going on until all hours of the night as everyone gets a chance to speak. I suggested that those meetings should be heard on the weekends. Also, the budget should be the only subject that is discussed during those meetings. The fourth item is overflow. This room is too small to handle the public when there are contentious issues. Therefore, the overflow is sent to the cafeteria where the LAUSD employees who work here are having lunch and of course, conversations. It is their area. It is not a room that works really well to hearing what is going on. There is also the problem for people who want to speak but there is not always the communication necessary to get them in the Boardroom. The fifth problem addressed is equal representation. Groups tend to stack the Board meetings, sometimes bussing in parents and as early as 6:00 in the morning so that every side does not get a chance to speak. This resolution mandates that all sides are heard equally. One of the goals of the District is supposedly parent and community engagement. As an earlier speaker said, and I'll paraphrase, just saying "engagement" over and over again does not make it engagement. I hope that you will look at this, that one of you will adopt it and present it for a vote. Unfortunately, three of the Board members, including Board President Monica Garcia, and Superintendent Austin Beutner, left before the presentation. As noted by Board Member Kelly Gonez, while "it is essential to have this conversation", without all members present, "all perspectives" are not represented. (1) As an example, she noted that the distance to Downtown and transportation issues provided obstacles to her constituents who wanted to participate in Board meetings. Gonez also brought up the fact that child care is an issue that needs to be addressed in order to have parents of younger children participate. 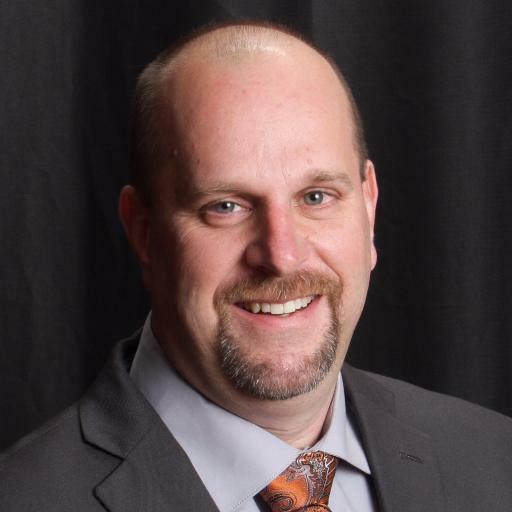 Board Member Scott Schmerelson was the most supportive of the resolution, promising to "iron it out" and to work on the resolution "to see what things are possible and what things aren't possible." His biggest concern was the fact that no specific meeting time would be acceptable to all members of the public, which could be solved by varying the meeting times. He also suggested that technology could be used to allow stakeholders to participate in meetings remotely from Board District offices. While Nick Melvoin also said that his Board "office would happy to look at these changes as well", one of his proposed solutions was particularly concerning. While having the Board delegate more "to the Superintendent" would in fact "streamline" meetings by reducing the number of issues that they discuss, the outcome is the opposite of what is called for by the resolution. 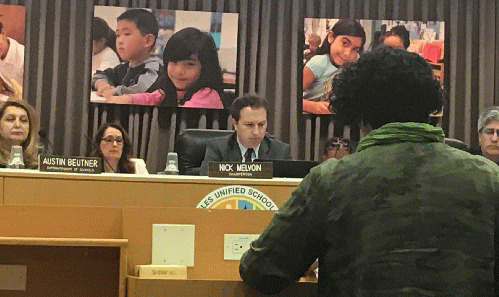 The Superintendent is an unelected position and transferring responsibilities away from the elected Board results in the public having even less input in the governance of the LAUSD. All three Board members who were present recognized that changes need to be made to the current system. Parents spoke in favor of the proposed changes both at the meeting and through an online petition. The full Board needs to follow Schmerelson's lead and move the resolution forward.